Equipped with state-of-the art metal fabricating technology, Charles Mfg. provides start-to-finish sheet metal fabricating services. With 30-plus years of manufacturing experience and an extraordinarily strong work ethic, we promise parts that "fit" and service that is second to none. High voltage bus duct for power generation and transmission systems. Automotive charging station for electric vehicles and process powder coating filter and collection cabinet. Aluminum housing for thermal imaging surveillance systems. Small to medium run batch part fabrication requiring unique set-up and sequencing of production steps. Expect your parts on time when you need them and at the lowest cost. Ipads used to link production, planning, drawings, job tracking, quality control, and production equipment. Yellow exciter guards for gold, iron ore and coal mine screening machines. Fabrications used by military, intelligence and security organizations. Using tablet-based job tracking tools, we can give you real time job status information anytime you need it. Seventy percent (70%) of manufacturing costs are determined by part design decisions. Our DFM input ensures that your parts are most easily and economically manufactured. 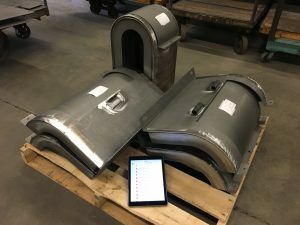 You’ve made a design change in your metal fabrication and your production schedule has been compromised. You can count on us to rearrange our production schedule, make your revisions and keep you on track. Our customers compete in a tough manufacturing world. They expect us to minimize fabrication costs and give them exceptional value for their manufacturing dollar and we do it. At Charles Mfg., attention is paid to detail, quality is unsurpassed, turnaround is fast and costs are closely controlled. This is the way we maintain long-term customer relationships. We promise metal parts that “fit” and service that is second to none!